I’m a big Miso fan ever since I got a multi-cooker for Christmas. I eat it with just green onion and tofu, or make variations of stone soup, which is basically a pre-planned meal or leftover stuff in my fridge from other meals. I usually stick with a simple tofu before eating something light,but for a heartier meal, the rice noodles are the ticket! This is better (and healthier) than chicken soup when you're sick too! Choose your own ingredients or try it my way! 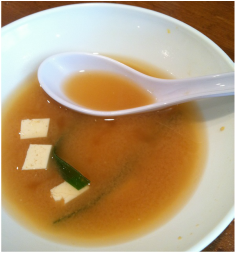 If you’ve never used the dashi granules before, they are a Japanese product that flavors the soup. It’s made of bonito and dried seaweed. It’s actually great added to many dishes and broths, but use wisely! It can be strong. The important thing is to taste, taste, and taste. Broths are the heart of all soups and you need to put some work into perfecting it! 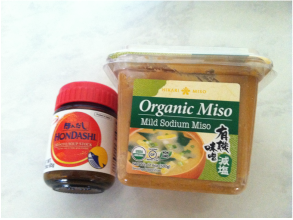 I got my Organic Miso and Dashi granules on Amazon because I am a Prime member, but you can also pick up at the Asian Markets as well. Do you have a question? You can send in a contact sheet via email. I didn't make this a blog with participation yet because I just haven't decided how big this section will be or how much time I'll dedicate to photos and recipes. If you want that type of blog, contact me as well! Onions Green (Scallions) sliced diagonally into 1/2 inch pieces, both white and green parts. NOTE: **Make sure they are washed and dried well, otherwise, they absorb a lot of the broth! (any type of mushroom! I’ve used fresh Enoki or Enokitake, dried shiitake, softened first, fresh shiitake, white button, and even Baby Bella mushrooms at times). It’s just a matter of what is available or convenient sometimes. 5-8 Baby Bok Choy (sizes vary) or 2 cups baby spinach or seaweed. *You can change amounts of ingredients as well, but if you put too much you should start with more broth, or just add water. Prep all ingredients before starting. Tofu should be drained and then dried on paper towel carefully on all sides, then cut into small squares. 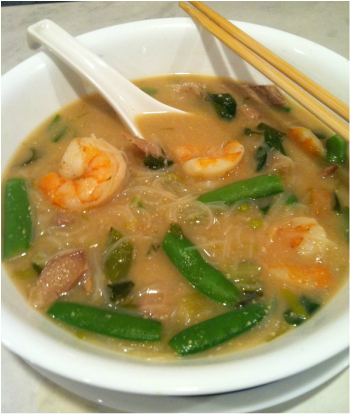 If using rice noodles, soak the noodles to soften in tap water for 10 minutes and drain. In a medium saucepan or electric multi-cooker on medium, combine the water with dashi granules and bring to boiling, stirring a few times to dissolve. Reduce heat to medium-low for light boil, and whisk in all the Miso paste until dissolved. Taste and adjust if necessary for balance of flavors. Stir in tofu OR noodles, Green onions, veggies and mushrooms and simmer gently for 2-3 minutes. Reduce heat to a very low simmer and then add shrimp just to warm through. Ready to serve! Enjoy!